I'm not a fan of Macklemore and Ryan Lewis's comeback single, Downtown. It's a Frankenstein's Monster of a song, stitched together from half a dozen half-formed ideas. I can't work out whether it's paying tribute to old-skool hip-hop or making fun of it. And what's with the chorus? 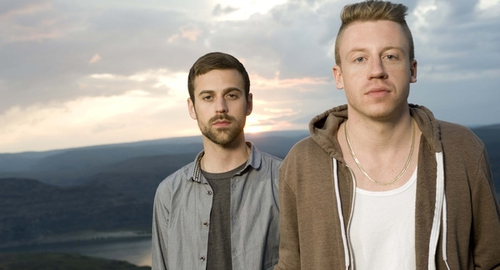 Is Macklemore a secret Roxette fan? The video is equally off-putting, full of crotch-grabbing and "hey bro" douchebaggery. What was everyone thinking? Luckily, Macklemore's next song - a duet with Ed Sheeran called Growing Up - is more focussed... and a lot less hateful. It was written for his baby daughter, he says, and "half of it is advice about growing up. The other half is trying to figure out how to grow up myself." Here's part of a long essay about her birth - and Macklemore's fears about being a dad - from his SoundCloud page.